The heart is a hollow muscular organ that lies in the middle of the chest cavity. It is enclosed in the pericardium, which protects the heart and facilitates its pumping action. The two atria (auricles): these are the upper two chambers. They have thin walls which receive blood from veins. The two ventricles: these are the lower two chambers. They have thick, muscular walls which pump blood through the arteries. The heart is divided longitudinally into two sides by means of muscular walls. 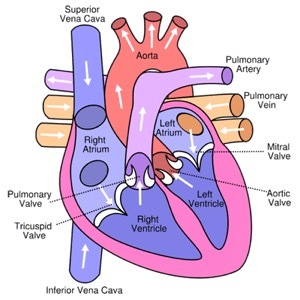 Each atrium is connected to its own ventricle through an opening which is guarded by a valve. Blood is permitted to flow only from the atrium into the ventricle, not in the reverse direction. The right valve (the tricuspid valve) is made up of three flaps. 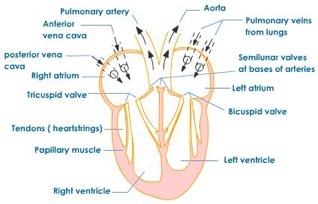 The left valve (the bicuspid valve or the mitral valve) has two flaps. 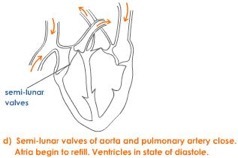 The semi-lunar valve can be found where the heart connects with both the aorta and pulmonary artery. The rhythmic heart beats are actually spontaneous, as they originate from the cardiac tissue itself. It has been proven that the heart continues beating regularly even after it has been disconnected from the body and the cardiac nerves. 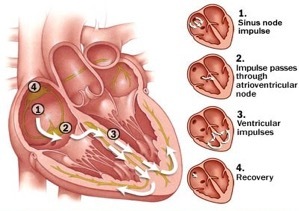 The sino-atrial node sends impulses over the two atria which are then stimulated to contract. When the electrical impulses reach the atrioventricular node (at the junction between the atria and the ventricles), the impulses will spread rapidly through special fibers from the inter-ventricular septum to the walls of both ventricles, where the muscles are stimulated to contract. The sino-atrial node beats at a regular rate of 70 beats/minute. It is connected to two nerves: the vagus nerve which lowers the heart rate during sleep and in states of grief, and the sympathetic nerve which accelerates the heart rate after waking up and in states of joy. Heart rate also increases with severe physical effort. The number of cardiac beats per minute changes according to the physical and psychological state of the body. We can distinguish two sounds in the heartbeat: the long and low-pitched ‘lubb’, which is due to closure of the two valves between the atria and the ventricles during ventricular contraction, and the shorter and high-pitched ‘dupp’, which is due to the closure of the aortic and pulmonary valves during ventricular relaxation. This phase involves the contraction of the two auricles, pushing the blood into the respective ventricles. 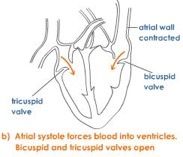 There is no backflow of blood due to the presence of the bicuspid and the tricuspid valves. The atrial systole takes 0.1 seconds. This is followed by the atrial diastole, whre both the auricles relax simultaneously. This takes about 0.7 seconds. This takes place alongside auricular diastole. 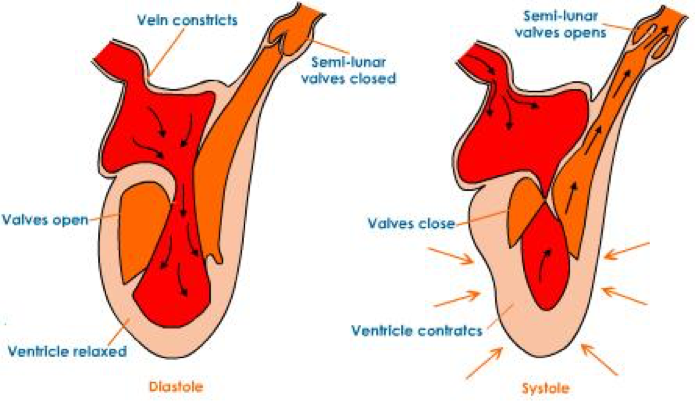 The pressure on the blood in the ventricles increases and the auriculo ventricular valves close rapidly to prevent the backward flow of blood into the auricles. This closing of the auriculo ventricular valves at the start of ventricular systole produces the first heart sound, called lubb. As the pressure in the ventricle increases, (and becomes greater than that of the pulmonary artery and the aorta), the semilunar valves guarding the openings of these arteries open, and blood enters them. From the right ventricle, the deoxygenated blood enters the pulmonary artery. From the left ventricle, the oxygenated blood enters the dorsal aorta, to be taken to other body parts. Ventricular systole takes about 0.3 seconds. Ventricular systole is followed by ventricular diastole. The auricles are already in diastole, so all the chambers of the heart are in diastole. When the ventricles are in diastole, the pressure in the ventricles decreases compared to the pressure in the great arteries. So, to prevent the backward flow of blood, the semilunar valves close rapidly. This produces the second heart sound, called dupp. During a complete cardiac diastole, blood from the superior and inferior vena cava slowly flows into the auricles. The pressure in the ventricles then decreases and eventually becomes lower than the atrial pressure. 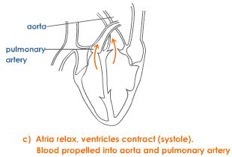 The AV (auriculo-ventricular) valves then open, and blood from the atria starts entering into the relaxing ventricles. 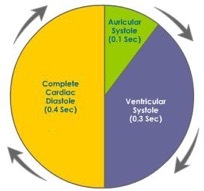 A complete cardiac diastole takes only 0.4 seconds. An entire cardiac cycle is completed in 0.8 seconds.